The fish and chip shop just along the way from the Courtyard Theatre in Stratford-upon-Avon hasn't missed a trick: one of its windows is home to a giant poster of a Dalek - emblazoned with the words: "Exterminate Your Hunger." Gregory Doran nods in recognition when I mention this, his expression wavering on the edge of a grimace before settling into a tense grin as he says: "I went in and asked them, 'Why have you got that up?' They said, 'Don't you know? Doctor Who is in town!'" In the normal scheme of things, asking him about his first production of Hamlet would involve all kinds of niceties surrounding the textual decisions he has taken, the ideas informing his modern-dress approach, and so on. Doran, 49, is now chief associate director at the RSC, with a formidable array of hit productions behind him. And, as a self-professed "Shakespeare nut", he can discourse for hours on, say, the differences between the Folio and the "bad" Quarto editions of the play, or the various flowers Ophelia gathers up for her mad scene. Thanks, though, to his casting of David Tennant as the Prince, rarefied contemplation must perforce give way to excited tittle tattle. Eight years ago, when Tennant was just another rising company star, playing a youthfully frenetic Antipholus of Syracuse in The Comedy of Errors, he would have been able to walk the sleepy streets of Stratford unmolested. Now he can't set foot outside the rehearsal room without avid autograph-hunters and infatuated fans moving in on him. "We were going to meet in a local cafe to have a chat," Doran says. "But David said, 'I can't go there now. Iit just turns into a sci-fi convention.'" Not a day goes by, apparently, without another needy or deserving devotee begging for their prayers to be answered with a touch of Tennant's Time Lordly magic. "People I haven't spoken to for years phone me up, saying, 'My daughter would really like it if…'" says Doran, trailing off with a sigh. "There's a lot of that. Fans turn up at stage door with bags of Doctor Who merchandise for him to sign. It's fantastic that there's so much excitement about this production, but he needs protecting from that level of intrusion." Doran is more used than most directors to this kind of hoopla. He helped Patrick Stewart achieve a blazing re-entry into the world of classical acting after years on board the Starship Enterprise. The early days of his recent revival of Antony and Cleopatra were dogged, he reveals, with Star Trek enthusiasts, but that species of attention swiftly declined. 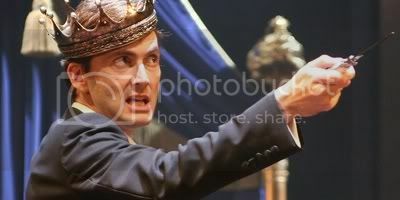 He's hoping, once again, that whatever motives may have driven punters to snap up all available tickets for Hamlet, "within moments of the play starting, they'll forget he's the Doctor". If Doran underestimated the scale of the home-grown hysteria that has attached itself to Tennant, that's because, he confesses, he hasn't been following the new Who. "I watched it as a child and remember hiding behind the sofa when the Daleks came on. And I watched the episode about Shakespeare's lost play, which was fantastic. But I stopped watching it when I was about 10, really, which is probably healthy. I don't think David would be surprised to hear that I'm not a great sci-fi fan." So, rather like the Tardis, has the rehearsal room, which also contains Stewart - who's doubling as the Ghost and Claudius - become a sort of safe haven from sci-fi natter and sci-fi nutters? Doran laughs. "Yes. Outside, there's this constant sense of having to deal with David's celebrity. Once the door closes, the play's the thing." That said, what with his production deploying mirrors to emphasise the atmosphere of continual surveillance at Elsinore, the evening will evidently be charged with thoughts about our own Big Brother society. Habitually mistrustful of grand directorial concepts, Doran nods in wary assent: "I think we can't help but view Hamlet in the context of 2008. Shakespeare attracts the iron filings of whatever is going on in the world like a magnet." A long-time admirer of Tennant's acting abilities, it was catching him on the BBC family history series Who Do You Think You Are? that prompted Doran to make the first move in the casting game. "He happened to go to a church in Northern Ireland during an excavation, and there among the planks on the floor was a skull. David picked it up, and I thought, 'That's like an audition for Hamlet.' In fact, I texted him that night and said, 'I saw your audition for Hamlet', and later we chatted." It was the star's additional unbidden enthusiasm for playing the cynical wag Berowne in Love's Labour's Lost - which Doran was also contemplating reviving - that clinched the deal. Doran makes no secret of looking forward to the light relief of Shakespeare's witty early comedy, rehearsals for which start within days of Hamlet opening. Before them, though, lies the daunting challenge of the most famous part in the canon. What qualities, finally, does he think will enable Tennant to scale this Everest of a role? "I knew he would be funny and charming," says Doran, "and I knew he would get the speed of the language - those elements are crucial. But he also has this remarkable facility to articulate his feelings without wallowing in them. "There are points when he makes you realise that all the wit is a front - an attempt to prevent Hamlet from seeing the abyss into which he's staring. At those moments, I think he has the potential to be truly great." Doran pauses, half-grins, half-grimaces again: "Even saying that, though, is to wonder whether his Hamlet is going to find its place in the pantheon, and that's an overwhelming pressure." Time - ordinary, linear and unstoppable - will tell.